Present generation enterprises inculcate sophisticated applications utilizing different technologies, various databases, and different types of end-user devices. In order to cope up with these divergent environments successfully, it has become essential for them to develop and maintain a platform. The result fruit is DevOps. The term DevOps is defined as the term which includes concepts of development and operations. It acts as a bridge to assure action of the processes of various departments – development and operation departments in preference. In the course of evolution of software development, various models have come into existence. 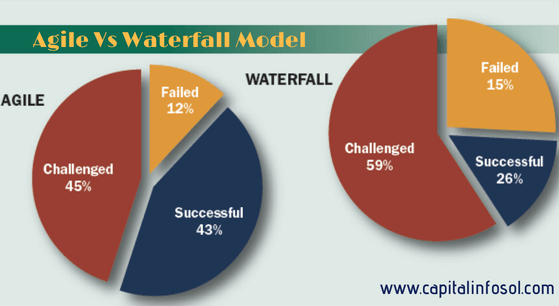 Their series is like traditional waterfall model, agile development model and DevOps approach. Let’s have a brief understanding on these approaches to understand the development and necessity of DevOps. The traditional waterfall model of software adopts a linear manner of the sequence of analyze, plan, design, build, test and deploy services. Clear and fixed requirements and stable product definition are the main characteristics of this model. Here, upon gathering the software requirements, planning and design of the system is done as per the Software Requirements Specification (SRS). Then comes the next sequential processes – system implementation, system testing, system deployment and system maintenance. However, certain challenges such as huge waiting time for code deployment, rise in pressure of work on old and new code development, and difficulty in maintaining uptime of the production environment arose. If any problems are brought up after testing or QA, then the code should be again sent back for development. Also, it was difficult to diagnose the product and give feedback. The infrastructure required for automation tools were also not effective. Agile development approach was designed to overcome these challenges. Compared to the traditional model, Agile development model is more efficient as its approach is nonlinear. Frequent change in requirements and fast development are the main characteristics seen here. It enables the developers to make immediate changes to the code when there is a change in requirement. It is done in short sprints that last not more than two weeks. With this, the development team had time to work on client feedback. Then, the next release is planned after fixing the bugs and incorporating the developed code. It reduces the risks associated with traditional model of software development. Agile Scrum, Kanban, Lean Development and Extreme Programming (XP) and Scaled Agile Framework are the most popular Agile methodologies. However, these approaches could help agility in development, but the operations could not speed up. There was a slow pace in development process and releases due to the lack of collaboration between Developers and Operations Engineers. Then, in order to fix these problems, arose DevOps – considered as the next generation of Agile. In 2009, Patrick Debois coined the term DevOps combining the two words Development and Operations. DevOps is considered as a software development approach which is an extension of agile development contexts. It is intended to improve the software delivery as a whole. It is a culture promoting collaboration between Development and Operations which help to deploy code to production in a faster, automated and repeatable way. High quality software is developed in shorter development cycles with DevOps. The speed of application and services delivery is increased with DevOps and thereby it ensures better customer service and customer satisfaction in the market. Whether it’s a mining, farming, transportation, healthcare, finance or manufacturing firm, it has become essential these days to incorporate software applications in different practices. Advanced software technologies including mobile technologies and cloud computing are implemented to make them stand in higher position. However, as discussed earlier, various problems arose with respect to software development that led to the need of DevOps. Here are listed some of them in brief. Inability of the development and operation team to work together made DevOps to evolve. Both these departments had tended to work in isolation in the past which led to many problems. A lot of time was spent earlier on the actual cycle as testing and deployment were isolated activities which were performed only after design and build processes. So, it is necessary to develop a system enabling code deployment without delay and without wait time. It is essential for the companies to develop a software system where development sprints are short and planned well. This assures the work happen on current code itself. Delay in end releases are found because of the non-sync between the actions of coding and operation teams. Easy administration with specific tools and systems is necessary for businesses and hence, DevOps is needed. The feedback systems and effective monitoring are the other considerations which are kept in mind to use DevOps. 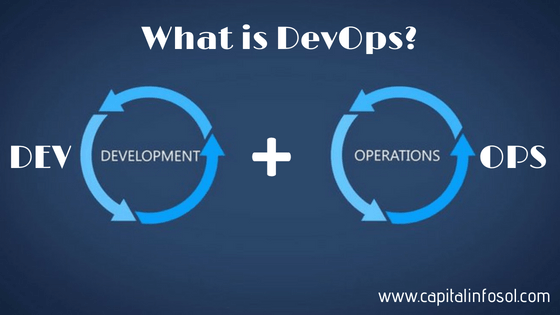 As you got to know the reasons for the necessity of DevOps, let’s know how it works. Specific lifecycle of DevOps and its workflow make you understand how it works. DevOps is the integration between development and operations. Different stages of DevOps working together constitute its lifecycle. Here are the stages of DevOps lifecycle. A constant or continuous development of software is done in this stage. The process of development is completely different from the traditional models. In DevOps, as the development process is divided further into small development cycles, it increases the speed of software development and delivery. Coding and building are the main processes involved in development phase of DevOps lifecycle. Different tools like Git and SVN are used in this phase to maintain various versions of the code. The code should be built and packed into an executable file to be sent for QAs for testing. Tools like Maven, Ant and Gradle are used for this. QA team of the company involves in continuous testing. Whenever a new piece of code is done, it is tested with tools like Selenium, JUnit, TestNG, JMeter, Cucumber and so on. Parallel and frequent bug testing is done to check if there are any errors in functionality. Bug tracking includes special bug trackers where software bugs and defects are accumulated and reported. BUGtrack, GitHub and JIRA are involved in bug tracking. Continuous testing phase of DevOps also enables the choice of using Docker containers which help to simulate a test environment. The code developed to support new functionality should be integrated with the existing prevailing code continuously and smoothly in order to show the changes to the end users. This process is carried on in this phase of continuous integration. The code is integrated into a shared repository by the developers many times a day. During this phase, it is necessary also to ensure that there are no errors in the runtime environment. The changes are also tested and checked how it reacts with other changes – thereby finding and preventing any integration problems. Jenkins, TravisCI, TeamCity, CircleCI, etc. are some continuous integration tools used by DevOps. Once the code is integrated, it has to be deployed to the production environment correctly on all the servers. The code is only released when it meets the test criteria. When the deployment is done in the right way, it should not affect the overall functioning of high traffic website and this should be welcomed. So, it is necessary for the SysAdmin to assure scaling up the servers and allow or host more users. As the deployment process is continuous, it is necessary to execute tasks quickly and frequently and Configuration Management (CM) is required here. CM is the process where it maintains till-date detailed records of software and hardware. Multiple information including network addresses, versions, requirements, design and operational information are maintained by CM. Popular configuration management tools like Ansible, SaltStack, Puppet and Chef function well and help in continuous deployment. However, consistency should be maintained across development, testing, staging and production environments. Containerization tools like Docker and Vagrant play a very important role in this stage. They also help in maintaining scale-up and scale-down at instances easily. When a company is involved in operating services online, then monitoring is the most important aspect to manage the IT performance and improve the quality of software. Any inappropriate system behavior or bugs that arise during production are found in this phase. Specific monitoring tools are required to ensure service robustness with respect to security, availability and performance. ELK Stack, Splunk, Nagios, Sensu and NewRelic are some monitoring tools of DevOps. They ensure monitoring the processes thereby checking the health of the system. If any major problems arise they are reported to the development team to process the continuous development phase and rectify the issue. Application Performance Monitoring (APM): The hotspots of the application framework are automatically detected and alerted through APM. Specific tools like AppDynamics, DataDog and NewRelic are involved in this type of monitoring. Infrastructure Monitoring: Any degradation in the physical or virtual resource performance and availability are detected automatically by infrastructure monitoring tools like Nagios, Sensu, AWS CloudWatch, Icynga and Zabbix. 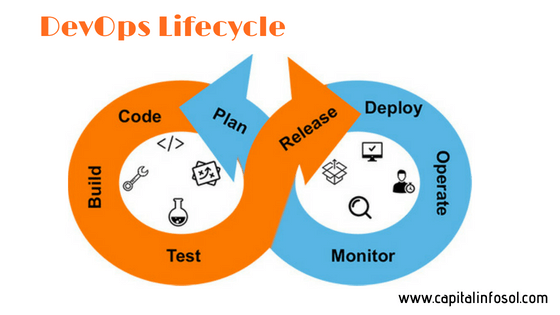 All these stages of DevOps lifecycle are carried out continuously in a loop till the achievement of the desired product quality. Workflow refers to any visual overview of the sequence of operation running in the environment. However, an input is provided to it and it shows the actions which are run and shows the output of the particular process. According to the requirement, the workflows help to arrange and separate jobs. Workflows also involve in providing the ideal process for job configuration. DevOps workflow involves continuous development and testing running in a parallel way – the result code is sent for integration. If any errors arise it is sent back to development. Otherwise it is sent for deployment and monitoring. Also, if it is not properly deployed again it is checked with development, testing and integration. In this way, the workflow is interdependent between developers and operators. The team of DevOps includes developers, testers, system administrators and many others and their role is prominent in each phase and is involved to work actively as per the workflow. It’s only the key role of DevOps tools that makes DevOps work significantly. As discussed various concepts above, different tools are being used in different phases of development, testing, integration, deployment and monitoring. Go on to have a look on some of the popular DevOps tools that are listed hereunder. GIT – It’s a free open source tool that tracks changes in the file and enables coordination of the work among the DevOps team. It has the capacity to branch workflow, allows distributed development and ensures faster release cycle. JENKINS – It is based on Java and is used in continuous integration server. With the help of around 100 plugins, it integrates all the stages. It also helps in automation, finding and solving bugs. It enables to script the pipeline involving one or more jobs in a single workflow. It also enables multiple ways of communication including CLI, Rest Api and GUI. DOCKER – It helps to pack the code or application before shipment and uses Docker container using any language. It helps to update with zero downtime. Puppet – It is also an open-source tool that is involved in configuration management. Independent to the platform, it helps in automation of inspection, delivery and operation of the software across the DevOps lifecycle. Chef – Transformation of infrastructure into code is possible through this open-source configuration management tool. Any cloud-based platforms can be integrated to this tool. It supports various platforms such as FreeBSD, AIX and so on. Ansible – It involves in automation of apps and IT infrastructures such as cloud deployments, network configurations, and creation of development environments. Nagios – Nagios is a powerful tool used in monitoring and helps in automatic fixing of problems when detected. The issues are solved upfront avoiding any loss to the business. Server performance issues are monitored with the help of this tool. ELK Stack – A combination of three tools Elasticsearch, Logstash and Kibana is termed as ELK Stack. It is also an open-source tool that is required for collection of insights out of the data. It helps to collect and analyze logs from the file to database or server. Splunk – The machine-generated data is searched, analyzed and visualized through a software platform, Splunk. It has the capacity to ingest data from any format and helps in monitoring business metrics for log insights. Till now you have got an idea about DevOps, its necessity, lifecycle, workflow and tools. With this brief information, we will next move on to know its benefits. As you know, DevOps is a cultural change that allows faster software delivery for organization efficiency. Here are the benefits of DevOps that enable success in firms of various industries. Improved quality – The quality of product development that incorporates infrastructure issues improves with DevOps. Maintainability – The overall recovery rate at the time of release is maintained or improved by the processes involved in DevOps. Predictability – The failure rate of new software product releases gradually decreases with DevOps. Cost Efficient – DevOps is an inspiration for all businesses as it is affordable. Thereby, small-sized enterprises can also prefer to incorporate DevOps without getting worried about economical issues. Faster Resolution – It ensures that the problems are identified and resolved fast. Happier Teams – Perfect collaboration, communication and integration is found between developers and operators. So, it includes multi-skilled employees working together without conflicts. In traditional methods where the teams work isolated, fights may arise blaming each other if any issues arise at the end result – however, DevOps avoids this. Security – DevOps ensures security and lower risk because of the incorporation of specific secured aspects in SDLC. The number of defects associated with the product also is decreased. Accelerated Application Delivery – Through DevOps, development is done through short software development cycles and the testing and other processes are carried out interdependently assuring faster delivery of any application. The interaction between various teams allows increased production rates. Continuous Customer Satisfaction – Increased and fast production rates, healthy and happy teams, better resolutions, ensured security and all the above considerations further add up to the best quality end product. This automatically enhances customer satisfaction. DevOps assures situational assessment with the use of right technology and this attitude helps improve software development and delivery. If all people of the IT organizations understand and maintain consistent communication regarding the underlying business goals, and act accordingly, then sky is the limit for organizational success. Though DevOps is considered to include developers, testers and operators, many other experts are also essential to make the approach successful. DevOps engineer is one such person who interacts with software developers, system operators and other IT staff and plays a crucial role in a company. Though it is the developers who are involved in continuous development, the DevOps engineers should have a basic idea of software development languages. He is also responsible to tackle the coding and scripting that are essential for software development kits. Today many businesses are waiting to hire certified DevOps engineers along with other IT department staff. The organizations are ready to offer very high salaries even for the junior DevOps engineer. So, even IT professionals, system administrators and anyone who are willing to join in the DevOps career can prefer online DevOps training and certification. Certifications from Red Hat, Amazon Web Services (AWS) and DevOps Institute are available today helping one to enter DevOps field. Tests are conducted for the trainees on the ability to develop, deploy, use and maintain applications on AWS and certified as AWS Certified DevOps Engineer. Red Hat Certification is being offered for different levels of DevOps professionals. They include Red Hat Certificate of Expertise in Platform-as-a-Service, Red Hat Certificate of Expertise in Ansible Automation, Configuration Management, Container Administration and others. DevOps Institute offers a platform for learning DevOps practices and based on the qualifications and competencies it has been provding certifications as Certified Agile Process Owner, DevOps Test Engineer, DevOps Leader, Certified Agile Service Manager and so on. Capital Info Solutions assists you in providing the best DevOps training in Hyderabad. Professional expertise is available at our institute to give training, assignments as well as hands-on experience with real-time project works. DevOps has become a default culture today in most of the organizations that are involved in using software development methods. It has been found that they are moving the needs from years to weeks and months. Devops is found to be the most in-demand skill for IT people. It is also expected to improve the DevOps processes in terms of every phase ensuring continuous improvement. In future, DevOps engineers will be able to access the end user product and also control it. 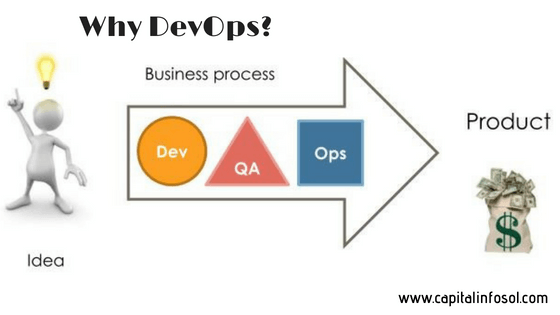 Keeping in view the work flow and ideologies of DevOps, it is the preferable choice for an organization in terms of quality management, product deployment and operational handling, and many others to upgrade continuous customer satisfaction.